Interested in river guide training? 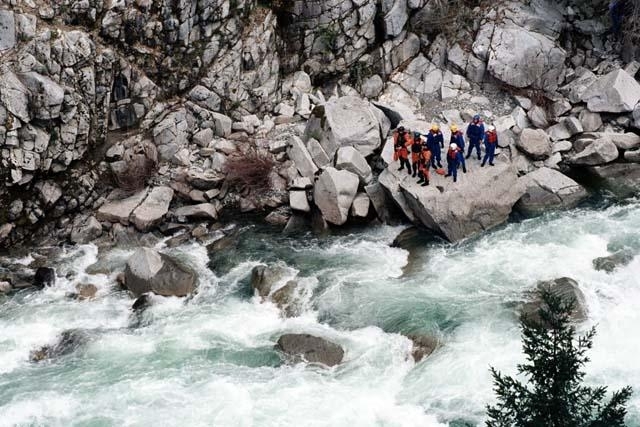 Our river guide school and whitewater guide training programs cover the full range of river guide & rafting guide experiences: whitewater river training, river rescue training, and rafting guide training. When you complete your river guide training you'll have the foundation needed in preparing you to become a commercial river guide or to lead your own whitewater river expedition! High Country Expeditions whitewater guide & river rescue schools provide our students with the most comprehensive hands-on exposure to the world of river guiding. Our guides and instructors are a wonderful eclectic compilation of highly educated and skilled boaters with an amazing array of skills, from Class V river guides to nature photographers, EMT's, river rescue instructors, ski-patrollers and storywriters. High Country river guide schools are a truly hands on outdoor adventure experience. People retain 20% of what they hear, 50% of what they write & 80% of what they do! We focus our energy on having our students experience as much as possible hands-on rather than just being shown & told. This makes for a much more effective learning experience and really helps our students retain what they have learned. These guide schools encompass not only the fundamental skills of reading whitewater and maneuvering boats, they also cover knot tying, raft rigging, signals, safety put-in talks, dealing with clients, class V safety techniques, equipment maintenance and repair, river conservation, local history, being in the wilderness and the finer points of creating safe, enjoyable river trips. High Country whitewater guide training will give you the solid educational foundation that is critical in the unforgiving river environment. This is a hands-on learning opportunity for outdoor enthusiasts wanting to get involved in commercial or private river guiding as well as for guides with previous experience wanting to enhance their skills. Having a variety of schools available allows you to pick the one that fits your needs and schedule. We offer several different types and lengths of schools to choose from according to what your individual goals are. We offer one week classes as well as weekend workshops for those who cannot commit to a one week course. We also offer a Spring Break Guide School for students and teachers in the school system wanting to learn river skills. To get more information and a copy of our enrollment form please contact us by phone at 1-888-461-7238 or via e-mail. We look forward to sharing an exciting and educational river adventure with you!